After reading Twilight two years ago, I became completely enthralled in Young Adult (YA books)! I always thought this was a genre for teens and not someone like me in their 30s. However, I was so wrong! I love YA books and I am not alone. 1 in 5 women between the ages of 35 to 44 years old say they frequently buy YA books for themselves! Even my mom who is in her 50s reads them. It’s nice to be able share books across the generations. 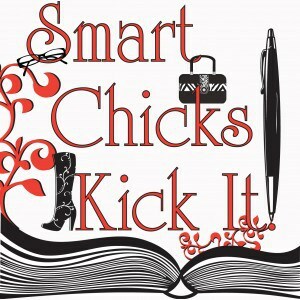 I am really excited to tell you about the Smart Chicks Kick It Tour which launches September 13th in North America. It’s a 12 city, two week tour that features 18 of today’s most popular YA paranormal romance authors! Each venue will have six to nine “Chicks” and the author line up will be different in every city on the tour so no two events will be the same. Check out the tour schedule to find out where the tour stops will be. Most of the cities are in the US except for one in Brampton, ON. Too bad I didn’t live in Ontario because I would be there for sure!! Check out the site or blog for more info. You can even purchase your very own Smart Chicks t-shirt! I am a fan of all of the authors!!! Would love to win! I like smart chicks on FB! I have your fall follower button on my site! I’d love this as I’m always on the hunt for new authors. Very cool! I need to get off my booty and write my books so I can join the next tour! 🙂 Thanks for this giveaway! I voted for you on the Picket Fence thingie. I love YA books. Thanks for the giveaway.